Today, children are growing up in a whole new world. The boom in technology means that children are facing a lot of new difficulties that their parents never grew up with. Children are now teaching their parents how to use their iPhone and post on social media. However, is it time to get back to basics? Accessibility to the internet and the immense amount of information available and shareable on the internet can cause many issues for young people, such as online bullying and an amplified pressure to meet expectations of friends, family and teachers. 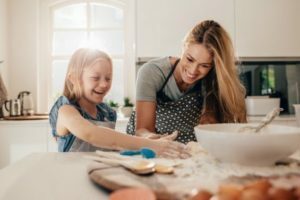 If you think your child is struggling with anxiety or depression, it is important that you build and maintain a positive relationship with them, and encouraging your child to help out in the kitchen may be the perfect way to do this! How can cooking be a positive experience for my child? Cooking is an excellent therapy activity for children struggling with anxiety or depression, as it is a co-mindful experience. Not only is it a positive and celebrative process that brings people together, but your child must pay and give attention to the food. Cooking requires focus and is best without multi-tasking. Whilst cooking, your child is able to naturally take their mind off of their day-to-today worries. Take frying an egg as an example. You have to look after and nurture that egg to make sure it cooks exactly how you want it. You can’t be distracted by your phone or any other device, as you might burn it. 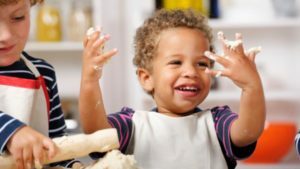 Cooking together is a fun activity and can make your child feel grown-up (for little ones), confident, and responsible. We all have to eat each night, and encouraging your child to help out in the kitchen provides a mindfulness, sensual, social and community aspect to their everyday. It is a collective and connective time where your child can get off their devices and be present with the family. It is a very effective way to help your child relax and refocus! There is a space for them to function and it illuminates the process of giving. Food is a beautiful space to explore and can be a very positive experience for children. Don’t start your cooking experience when your child is already hungry. Sit down and eat your food together after you cook it. What more can I do to help foster self-esteem in my child who faces anxiety? Time, care, love and support. Get back to the basics and build a relationship with your child without technology. It is a parent’s role to model balance and resiliency. Create time and space for your child and your family. Make them feel understood, appreciated and nurtured. For more information about Chris Dickson or to make a referral today, click here.